Skinnygirl On-the-Go Bars are natural, kosher, and vegan. Indulge in the natural 200 calorie snack. 2-100 portions per bar make a great on-the-go treat or afternoon snack that is guilt-free. The indulgent treat made for those striving to maintain a healthy lifestyle. They are the perfect, easy On-the-Go option for busy individuals in need of a quick and healthy bite to eat. 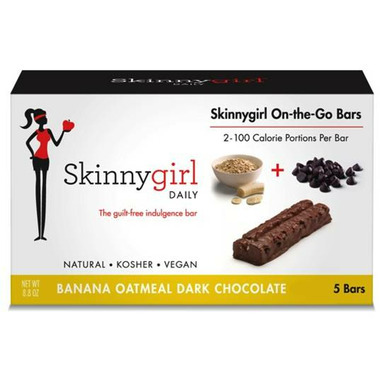 I have always heard about the "Skinny Girl" but was excited that Well.ca brought in the product. 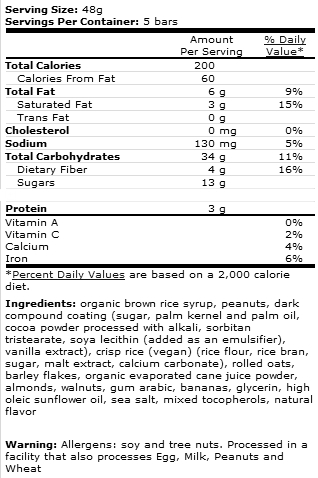 I got to try the 100 calorie bar as a free sample,but bought the 180 calorie Banana Oatmeal Dark Chocolate bars. The 2-100 calorie bars are good but I personally love the 180 calorie bars better. They are super moist, crunchy and have a yummy flavour. The banana doesn't overpower the flavour but blends wonderfully. Can't wait to order my next box, luckily if the 180 calorie bars are sold out, you still have the 2-100 calorie bars.Win!Win !LOVE the product, good choice on bringing this product available for us, consumers!!Thank-you!!! These are delicious if you like banana and chocolate! Wow! It's like having a healthier candy bar! And I love that you can cut them apart and only have 100 calories instead of 200 calories! You do need a knife though to cut off your 100 calorie portion, as it's quite dense so you can't break it apart. But the fact that it's dense also makes it quite a filling treat! It fixed my sweet tooth craving without me wanting more and more like a candy bar would! What I liked doing was then further cutting my 100 calorie stick into 5 "bite sized" pieces.